Wednesday | January 18, 2017	Usher in this Spring with auspicious dishes from Bakerzin Spring Festive Dine-In Menu. A joyous celebration with families and friends to indulge, enjoy and bask in this happy festive spirit. Start off the meal with Treasure Pockets, generous dollops of homemade salad of fruits and prawns wrapped with Japanese bean curd skin, symbolizing pockets of abundance in wealth and luck! Turn your choices to one of 4 Mains available, from Lobster Seafood Fortune Roll, Opulent XO Noodles with Roast Pork Crackling, Spring Abundance and Korean Prosperity Chicken with Kimchi Riceballs. 1. Lobster Seafood Fortune Roll; Pamper yourself this Spring with a deluxe reunion of fresh lobster meat and succulent crayfish in a blend of Mentaiko sauce, nestled on a buttery home-made croissant roll. Serves with mixed garden greens and golden fries. 2. Opulent XO Noodles with Roast Pork Crackling; Marinated and slow roast to perfection, every delicate cut of the pork belly is deliciously moist and tender. Each pork crackling is crisp to the very last bite. Serves with Chinese soba noodles to usher in a prosperous new year, tossed and sautéed with Special XO sauce. 3. Spring Abundance; Fresh red snapper grilled to perfection dressed on minty pea mash, served with mixed garden greens. 4. Korean Prosperity Chicken with Kimchi Riceballs; Thick-cut lightly spiced butterfly chicken, fried to a golden crisp, and coated with homemade Korean Soy Garlic Sauce. Serves with a pair of Kimchi riceballs, topped with generous shards of seaweed strips. All good things come in pairs. Complete your meal on a sweet note with a slice of Auspicious Red Velvet Cake, a refreshingly light flavoured cream cheese encased in triple layered red velvet sponge, splashed with red sprinkles. 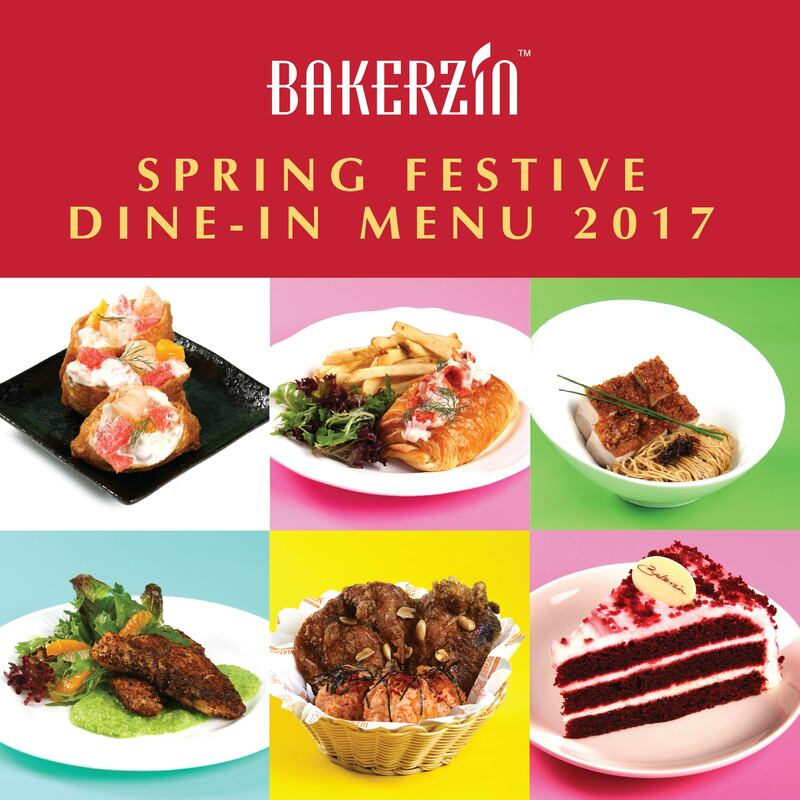 Bakerzin Spring Festive Dine-In Menu is available now for a limited time only!